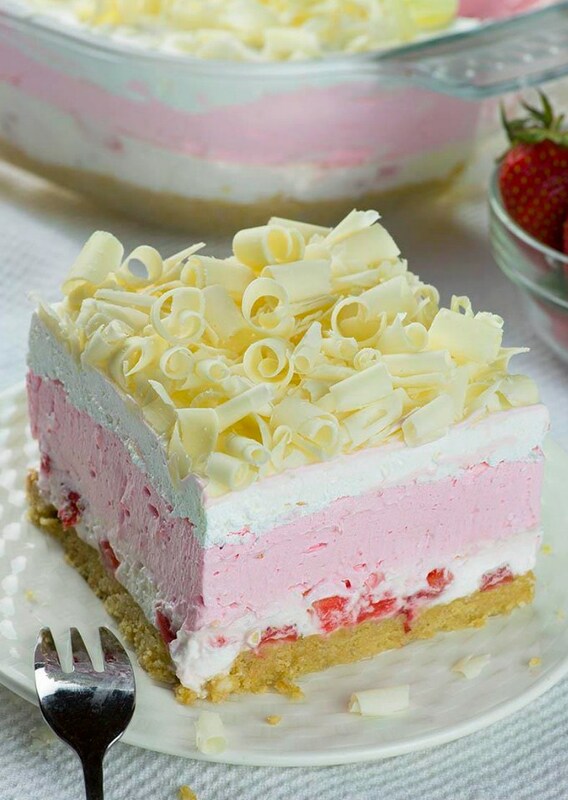 No Bake Strawberry Jello Lasagna is quick and easy dessert recipe for refreshing summer sweet treat and use only few ingredients. To make the crust ground whole Oreo cookies with the filling in a food processor to make fine crumbs. In a bowl stir together ½ cup melted butter with Oreo crumbs until evenly moistened, then press the mixture in the bottom of 9 x 13 inch dish, set in the freezer to firm while making cheesecake layer. In a bowl cream together ½ cup softened butter, 8 oz. softened cream cheese and 1 cup powdered sugar until smooth and creamy. Add 1 ¼ cup whipped cream and mix to combine. Using a rubber spatula, gently fold in diced strawberries and spread the mixture over chilled crust. Place in the fridge. In a large bowl place strawberry Jello, add ½ cup boiling water and stir to dissolve completely. Whisk in 1 cup strawberry Greek yogurt until combine. Add 4 cups whipped cream and mix until combine evenly. Pour the mixture over cream cheese layer and smooth the top. Refrigerate for 2-3 hours until set. Spread 2 cups whipped cream on top. To make the curls, carefully draw a vegetable peeler across the broad surface of a bar of white chocolate at room temperature. Sprinkle curls on top. Refrigerate for 2 more hours before serving, or overnight. For whipped cream you can use thawed whipped topping like Cool Whip (you’ll need about 22 oz.). For homemade whipped cream, beat 3 ½ cups chilled heavy whipping cream with 2 teaspoon vanilla until soft peaks form. Add powdered sugar to taste and continue mixing on high speed until STIFF PEAKS form.